Go on — be a drama queen! Just make sure you dress the part with this ruffled sequin top and pant set from the King of Fashion himself. The eye-catching, perfectly matched design features feminine eyelash ruffles that create a figure-flattering look you'll love to make grand entrances in. Love this!!! So well made easy to take care of. Can be used for the dressy and dressy casual occasions!!! Antthony, you are a heaven-sent designer!!! 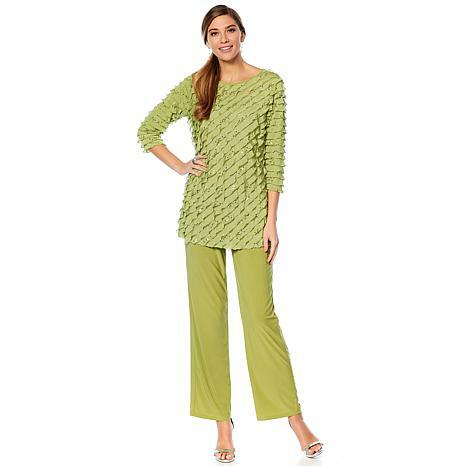 I just love this pant suit I got the green the color is so beautiful. Wish I could get it in the other colors they were all sold out. I love everything about Anthonys clothes. Cut, style, excellent quality. He is a womans designer. I bought this outfit in the red and green. Many compliments!!! I just received Anthony ruffle 2pc set in the peacoc and the red color. It fits beautiful, I am taking both outfits on a cruise in June. It looks better than I expected. Love them both beautiful colors.